The majority of contemporary basketball, or basketball-inspired, footwear is often far too smoothly molded and aerodynamic to really be worn off court. It is an aesthetic derived mainly out of functionality, somewhat like a Formula One car - it looks great, but only in context. And yet, there is something to be said for more retro-inspired basketball sneakers. In my opinion Air Jordan's should have stopped after their fifth reiteration. 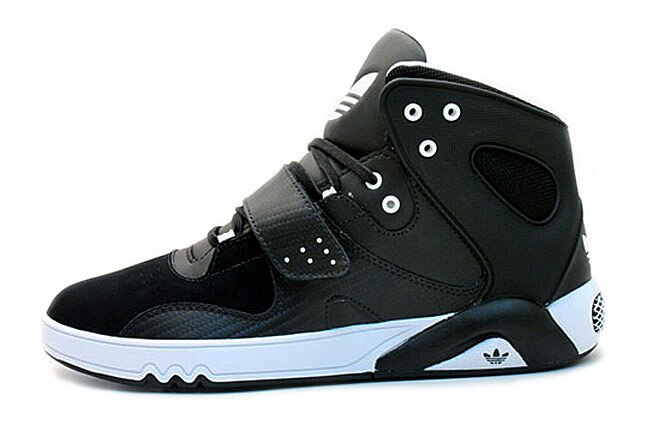 I like my basketball sneakers without all the curves and bumps that seem popular today. I far prefer a pair of Converse Weapons, Adidas Forums or Nike Dunks. I think that is why I like these Adidas sneakers - they are retro, however they do have something of a more refined contemporary edge that does not detract from the overall design. I would prefer them without the ripples at the front of the sole, but I suppose it was compromise for the newer crowd more at ease with Jordan XXIII's than Jordan III's. Everyone has heard the saying that only rich people can afford to buy cheap shoes, yet in practice it never really seems the case. 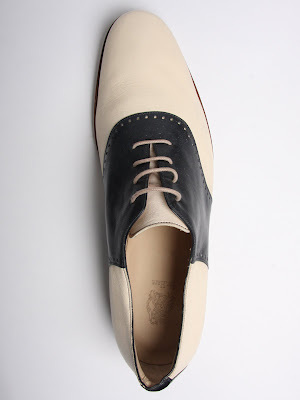 I keep thinking that I ought to save up some money to buy a proper pair of quality leather shoes in some classic design. But then again, as much as I love classic shoes, I do have a tendency to be drawn towards the more colourful alternatives. However here I think there is a finely crafted middle option. 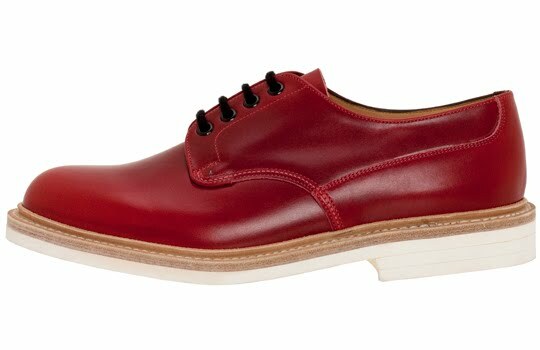 Keeping a more traditional shape Church's have a beautiful pair of smooth-toe leather shoes in the somewhat unusual choices of red or blue, both with white soles. They are I suppose that clichéd term, a reworked classic, and I absolutely love them. 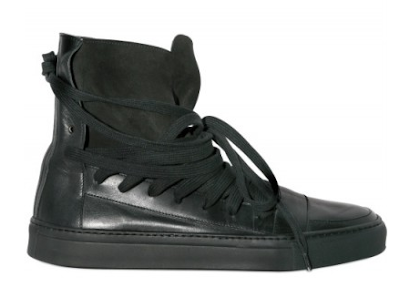 Some readers may recognise these sneakers from this post I wrote previously on Kris Van Assche's ubiquitous designs. There is something about the drape and softness of the suede alongside the more structured shape provided by the nappa leather that I find magical. 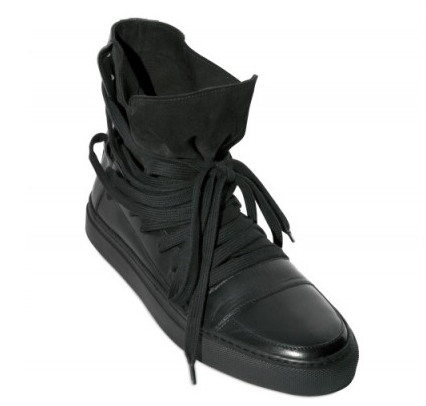 The wrap around laces remind me of classic streetwear, of loosely laced Air Force Ones or Nike Dunks, but equally of beaten up leather boots laced only to the ankle with the upper left loose. The fact that the laces even on the foot literally wrap around, with the eyelets far down either side of the foot, provides quite the unique and distinctive look. 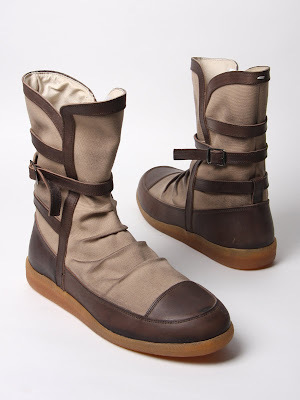 These sneakers make me think of the Bedouin and the Jedi, both of which are cool in my books. Fully lined in leather, with aged canvas and brown leather trim, I love the look of these. They are more akin to boots than sneakers, however the trademark Margiela rubber soles gives them that more casual appeal. It is the detailing that makes these so appealing, from the pleated canvas, to the strap and buckle, to the curved shape of the lip. In a way I suppose they remind me of the Westwood Pirate boots. I would love to rock these with a pair of beat up skinny jeans tucked into them, a grey jersey long sleeve t-shirt with raw hems and a cosy, oversized green wool cardigan (just give me the sneakers, I have the rest covered!). 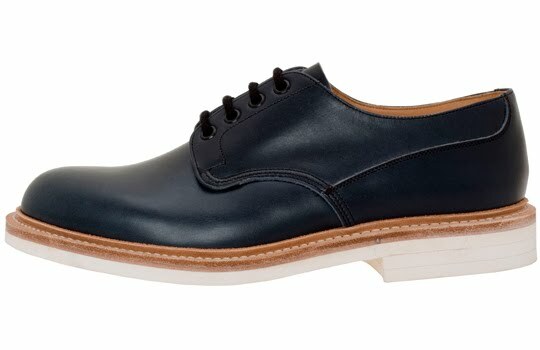 I have been on the hunt for a good pair of saddle shoes for as long as I can remember. 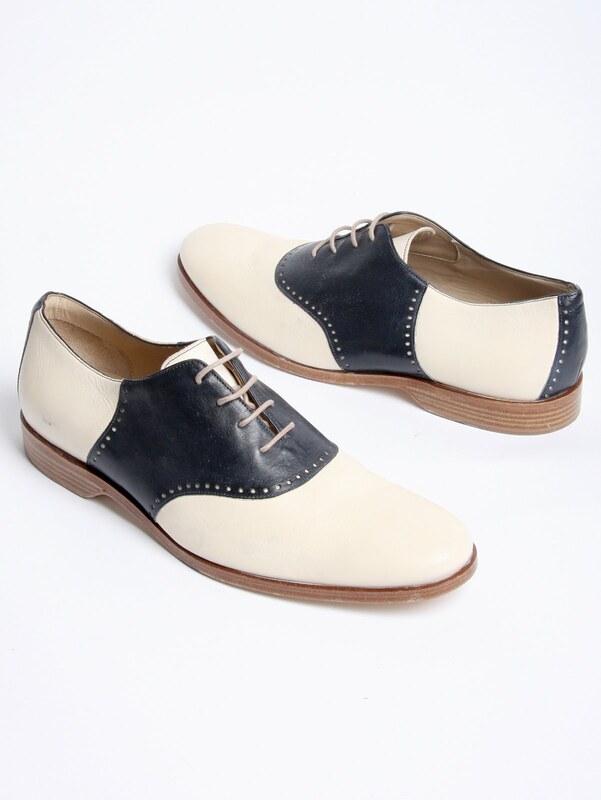 These cream and navy offerings from London-based Mr Hare would be it for me. Love them. Every one of these shoes evokes some sense of personal nostalgia in their design. They are relevant to me and that makes them all the more attractive. I generally go for girly-to-the-extreme shoes, but I'm swooning over the Church's. What a marvelously classic shape. Good luck on the hunt for those saddle shoes - the navy and white look absolutely fantastic, darling! loving the church shoes. might have to grab a pair in black. I think women can pull these off easily as well, with the right outfit. Love the designs and I'd love a pair of each myself. I think I've died and gone to shoe heaven. agh! I love a boy that knows good shoes! I'm calling the Margiela's "the Jedis." I can't actually imagine wearing them, but still. I can say that Adidas is a wonderful running sneaker specifically suited for my high arch.This is the 3rd pair I have purchased and am extremely satisfied with them. Will continue to purchase this product. Anyway, thanks for sharing and I will definitely visit here more often.